For all my vegan friends, please avert your eyes. 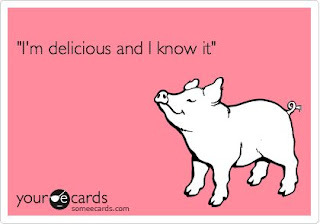 It's National Pork Month! For everyone else, read on because this was delicious! Event hostess writes: Pork is among one of the most versatile meats we can work with... from skewers, to stews, to side dishes and main dishes... from bacon, to chops, jowls, ribs and roasts, pork can emphasize any flavor. Let your creativity soar this month as we celebrate National Pork Month. Posting day is always the first Wednesday of the month. If you are a blogger and you're interested in joining in the fun, visit us at our Facebook Foodie Extravaganza page. You can also visit our past party submissions on our Pinterest Foodie Extravaganza board . to see what we're celebrating next month! Preheat the oven to 450 degrees F. On a parchment-lined baking sheet lay the tomatillos, peppers, and onion. Drizzle with olive oil and roast for 30 minutes. Let cool for 10 minutes. Mix the flour and ground cumin together in a medium mixing bowl. Roll the pork cubes until they are completely covered in flour. Keep at a simmer and cook for at least 90 minutes. The pork should be tender. Season to taste with freshly ground salt and freshly ground pepper. Fold in 1/4 C chopped cilantro. To serve, ladle into individual serving bowls. Garnish with more fresh cilantro and a lime wedge. Oh yummy! This looks absolutely perfect right now with the weather getting cooler. Hominy is not something I use very often, so it will be a fun change to our menu! This sounds AMAZING - so many fantastic flavors in there. Yumm! This looks like something I would get cravings for... thanks for sharing! Wow perfect for the present weather here in India. Love the vibrant colours as well Camilla! There is so much flavor here, I love it! This sounds amazing...I can't wait to try it and I still have some tomatillos from my last CSA basket. Oh my goodness, this sounds amazing! What a great recipe! This sounds delicious, so flavorful. Yum! Yum! This sounds delicious! I haven't tried hominy yet. It is definitely on my list. Thanks for joining this month! This is right up my alley! I love all of those spices and flavors!! Yummy! Thanks for sharing! My mom makes posole occasionally for my brother-in-law because it's one of his favorite dishes but I don't think she roasts the veggies first. I need to show her this because I'll bet the flavor is extraordinary. Sounds yummy and so flavorful. I love Mexican food, so I might have to try it out!